Sellier & Bellot’s planned, tactical approach to the market offerings by other manufacturers of fully non lead projectiles for use in hunting situations where you need specific performance metrics met. The penetration, uniformity of deformation and the weight retention are all exceptional for this round and the copper and zinc alloy makes to an interesting way to pack in 180 grains for major power cartridges. 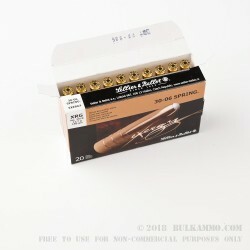 The top tier components are matched with these high end monolithic bullets with a small tip of aluminum on top. Sellier & Bellot is among the largest volume producers of ammunition in the world and their 30-06 ammo offerings are among the most popular here in the states. 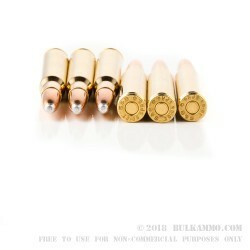 S&B knew it didn’t want to just load Barnes and Hornady copper bullets to propagate the newest technology for hunting, they needed to aggressive develop and produce their own projectile that had mass market appeal. This is the result and it is very good. Nearly 100% weight retention; heavy bullet weights; uniformity in expansion and reliability of deformation – this is a premium hunting projectile. 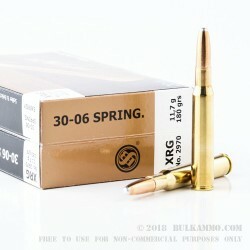 In the 180 grain weight featured in this .30-06 Springfield round, it is a bit more of a brush gun than it is the supersonic stinger that is famously the ‘ought six. Q: ¿Cuál es la velocidad?